The 'Summertime Sadness' singer has announced her fourth studio album 'Honeymoon' will be available on September 18, with fans gaining an instant download of new song 'Terrence Loves You' when the LP is pre-ordered. 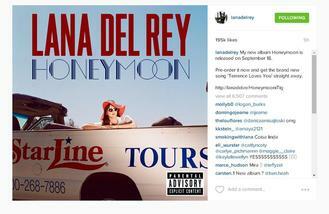 Along with the album artwork, which she posted on Instagram, she wrote: "My new album Honeymoon is released on September 18. Pre-order it now and get the brand new song 'Terrence Loves You' straight away. (sic)"
The 30-year-old star has already premiered the title track 'Honeymoon' and lead single 'High By The Beach', but also surprised fans with the tracklist which suggests as well as original material, the record may contain covers. A song by the name of 'Don't Let Me Be Misunderstood' features on the album, suggesting it is a cover of the Nina Simone classic, while it also seems to include an interlude of TS Eliot's poem 'Burnt Norton'. The album follows 2014's 'Ultraviolence' which topped the charts in both the UK and the US. Later this month, fans will also hear the 'Born To Die' singer's collaboration with The Weeknd, which will feature on his new album 'Beauty Behind the Madness'.